Samson's MixPad MXP144FX 14-Channel Analog Stereo Mixer with Effects and USB combines uncompromising sonic quality with roadworthy durability! The MXP144FX offers six MDR mic preamps with four of the channels equipped with single-knob compressors for studio-quality dynamic control without the non-stop tweaking of external gear. All channels on the MXP144FX are controlled via precision 60mm faders and feature a 3-band EQ, Gain trim, high pass filter and mute switch. 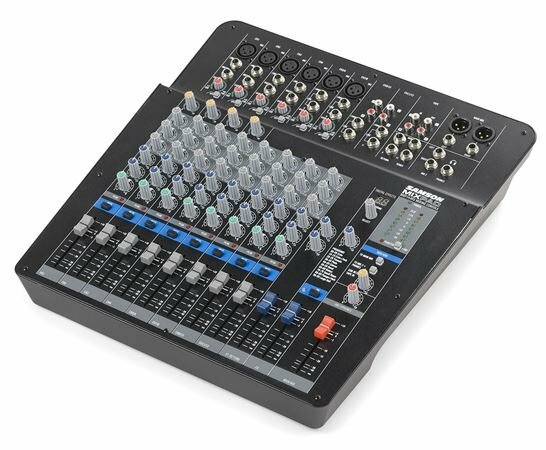 In addition, each channel on the MXP144FX has a pre-fader Aux send for your monitor mix and a post-fader Aux send for introducing external effects. 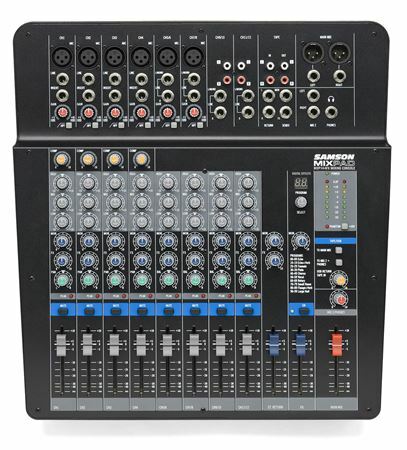 Exceptional output flexibility makes the MXP144FX a worthy companion regardless of venue size, giving you precise fader control over your Main Mix (XLR and 1/4 inch outs), as well a Mix 2 output, headphone (Phones) monitoring with level control and a RCA Tape out for recording your performance.